WOT (Web of Trust) recently awarded it’s 2009 “WOT Publicity Award” to 10 Bloggers and happily, Tech Thoughts was one of the recipients. It would be difficult for regular readers of this site not to be aware, that I write consistently on the importance of Internet browser protection, and how strongly I feel that Web of Trust, is the application leader in providing critical Browser protection. In fact, I frequently hear from readers who, after installing WOT on their computer systems, feel reassured that they are safer than ever before, and who express a renewed sense of confidence, and a new level of enthusiasm, while surfing the Internet. And why not. Security starts with your web browser, and WOT substantially reduces the risk exposure, that comes with wandering through the increasingly risky neighborhood that the Internet has become. WOT, one of the most downloaded FireFox Add-ons at the Mozilla add-on site, (also compatible with Internet Explorer and Chrome), is a free Internet Browser resource which investigates web sites you are visiting for spyware, spam, viruses, browser exploits, unreliable online shops, phishing, and online scams, helping you avoid unsafe web sites. For example, here’s a Google search in which WOT indicates which sites are safe. 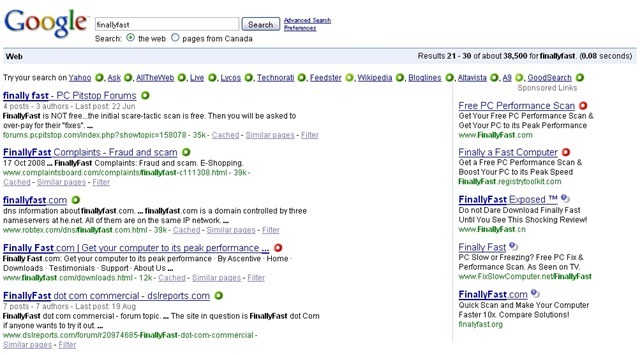 Notice the unsafe (red) sites, in the Google ads! Take a look at what happens if, in fact, you do end up on an unsafe web site. WOT’s dropdown warning current blocks access to the site until you determine otherwise. WOT operates in a unique fashion in order to offer active protection to the Internet user community. It stands out from the crowd of similar applications, by soliciting the opinions of users/members whose views on web site safety are incorporated into the overall site safety rating. According to WOT, the user community now has reputation data on over 25 million sites worldwide. 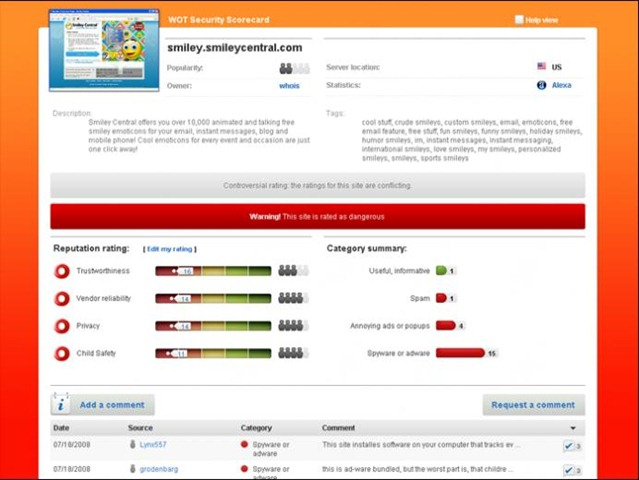 The shared information on a site’s reputation includes trustworthiness, vendor reliability, privacy, and child safety. As well, in order to achieve maximum security coverage, WOT uses thousands of trusted sources including phishing site listings, to keep users protected against rapidly spreading threats. WOT integrates seamlessly with search engine results from popular search engines including Google, Yahoo, MSN and other popular sites, and provides impressive protection against Internet predators. WOT recently added the top three web-based email services – Google Gmail, Windows Live Hotmail and Yahoo! Mail, to its free security protection. You can now feel more confident and secure, since WOT checks links embedded in your email, and warns you of dangerous web sites so that you can avoid spyware, spam, phishing, identity theft and other Internet scams; before you click on dangerous embedded links. The Browser add-on icon, displays a color rating for each site you visit, indicating whether a site is safe to use, should be used with caution, or avoided entirely. Using traffic light colors, (green, yellow, and red), WOT leaves you in no doubt as to the safety rating of a web site. An impressive feature of WOT is the dropdown transparent warning curtain, shown earlier, triggered on visiting a dangerous site. Recognizing that up to ten percent of Internet users are at a disadvantage however, due to colorblindness, and cannot rely on an Internet safety system based on color coding, the Web of Trust development team recently released an adaptive version of WOT. This version incorporates equivalent alternative information, through assistive or adaptive technology, for colorblind users. This colorblind accessible application provides the same critical benefits to those individuals who have to contend with visual impairments, as it has to those of us who have come to rely on WOT as a major defense against the pervasive hazards we encounter on the Internet. WOT rating icons appear beside search results in Google, Yahoo!, Wikipedia, Gmail, etc. Interface supports English, French, German, Spanish, Italian, Russian, Polish, Portuguese, Swedish and Finnish. Bonus: Watch a demo video showing how WOT works in practice. I use WOT on all of my computers and browsers. It is a great add-on. In today’s world you never know if a site is safe and if it comes up red I stay away from it. I am always asked by my friends why do people want to harm your computer, I always answer with, well they must be bored and have nothing else to do with their free time. Yes, you’re right – with the Internet you just never know, and WOT takes the guesswork out of it. I also use WOT on my computer together with FF . So far I am very pleased with it . Good to hear you use WOT, and FF. I install WOT on every browser I use. Anyway, Tech Thoughts absolutely deserves the “WOT Publicity Award”, and congrats Bill. You’re a very smart computer geek, so I’m not surprised to see that you’re a WOT user. Good to hear that you participate in WOT ratings. I just heard of WOT some few weeks back and i really like the way it works.